The Gordon Setter’s lineage dates back to 1620 and was used for hunting game birds at the beginning of the 19th century. The Gordon setter is the heaviest of the setter breeds and although it may look somewhat similar to the Irish and English Setters, the Gordon Setter is a separate distinctive setter breed. Originally, the Gordon Setter was referred to as the Black and Tan Setter and was officially classified as “The Black and Tan Setter” in 1873 by the Kennel Club and on the 1st of January 1924 was officially designated “The Gordon Setter” by the Kennel Club. At the beginning of the 18th century, there were several noted kennels of the Black and Tan Setters, the most notable of which were the kennels of the Duke of Gordan who is credited with establishing the breed with its current characteristics in the 1820’s. The Duke of Gordan obtained his original stock of Black and Tan Setters from Thomas William Coke, who was later known as the Earl of Leicester. George Blunt and Daniel Webster imported the first two Gordon Setters, named Rake and Rachael, to the United States in 1842 from the Duke of Gordon kennels. The breed was recognized by the American Kennel Club in 1892. 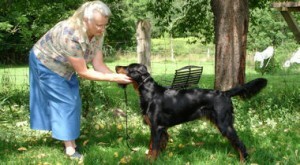 The Gordon Setter is a very intelligent dog that excels as a family, show and sporting dog. They are exceedingly loyal, build strong bonds with their families and tend to be strongly protective of the family children. As a sporting dog, it’s loyalty is such that it is considered a one man’s hunting dog and will strive to work all day for its master. However, the Gordon Setter needs plenty of daily exercise and does well in a fenced yard in which it can run and play; or it needs to be taken on plenty of leashed walks. It is a long haired breed, with a long feathered coat that need to be brushed twice a week; or more frequently if your Gordon Setter is to be groomed for showing. The Gordon Setter is a good-sized, sturdily built, black and tan dog, well muscled, with plenty of bone and substance, but active, upstanding and stylish, appearing capable of doing a full day’s work in the field. Shoulder height for males, 24 to 27 inches; females, 23 to 26 inches. Weight for males, 55 to 80 pounds; females, 45 to 70 pounds. Head deep, rather than broad, with plenty of brain room. Eyes of fair size, neither too deep-set nor too bulging, dark brown, bright and wise. Neck long, lean, arched to the head, and without throatiness.Topline moderately sloping. Body short from shoulder to hips. Chest deep and not too broad in front; the ribs well sprung, leaving plenty of lung room. Shoulders fine at the points, and laying well back. The tops of the shoulder blades are close together. The hind legs from hip to hock are long, flat and muscular; from hock to heel, short and strong. Coat, soft and shining, straight or slightly waved, but not curly, with long hair on ears, under stomach and on chest, on back of fore and hind legs, and on the tail. Black with tan markings, either of rich chestnut or mahogany color. Black pensilling is allowed on the toes. The borderline between black and tan colors is clearly defined. Gait, a bold, strong, driving free-swinging gait. The Gordon Setter is alert, gay, interested, and confident.